Rhinoplasty is the most-often requested procedure by teenage patients in New York City. This is not surprising given today’s societal pressure to fit in combined the popularity of social media websites and the “selfie” culture that comes with it. 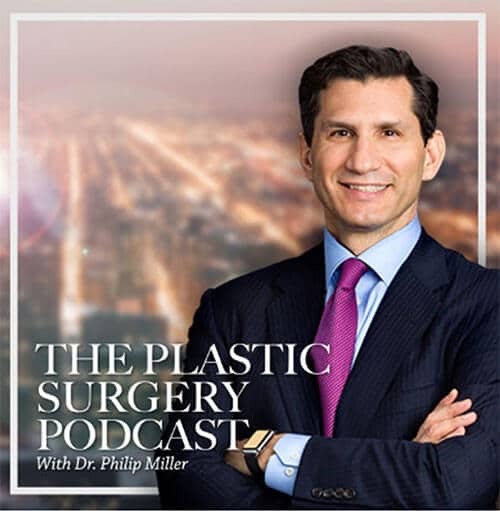 While some professionals assert that teens are not mature enough to understand or deal with the implications of plastic surgery, Dr. Philip Miller believes that parental involvement and careful patient selection can ensure the process is beneficial and highly successful for the right teenage patient. How Does Dr. Miller Evaluate a Teen Rhinoplasty Candidate? 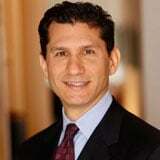 Dr. Miller takes a very conservative approach to evaluating teenage rhinoplasty patients in New York City. He understands that it is critically important for these patients to have realistic expectations about the procedure’s outcome. He is careful to ensure that the teen does not view rhinoplasty as a “cure all” solution. Dr. Miller’s careful screening process – which includes both the teen and parents – is a testament to the special professional responsibility he assumes for this particular type of patient. He does a thorough assessment to ensure the teen is psychologically mature enough for the entire process and that the teen fully understands the benefits and potential risks. In some cases, Dr. Miller may also call upon a psychologist to assist with the evaluation process. 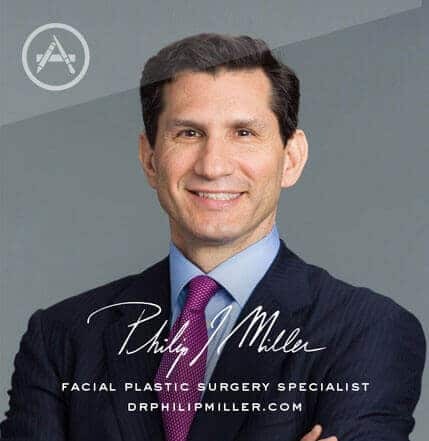 Dr. Miller does not accept every teenage rhinoplasty candidate with whom he consults. As a responsible medical professional, he believes his ultimate obligation is to ensure that the nose job procedures are only performed on those teenagers who are physically and psychologically ready for all aspects of the surgery. What Are the Benefits of Teen Nose Job Surgery? For the teenage rhinoplasty patient, the benefits of a nose job surgery can be great. The teenage years are difficult under the best of circumstances. With social media, “selfies” and bullying at all-time highs, today’s teen faces an endless amount of pressure. When a teen’s focus of dissatisfaction is his or her nose, it can overshadow all other aspects of day-to-day life and make the teen years an unpleasant experience. Often times, these concerns can be easily corrected with a nose job. Teens recover quickly from rhinoplasty procedures, and end results can be positively life-changing. In some cases, teens require rhinoplasty to address structural deficiencies that cause breathing difficulties. Whether caused by nature, accident or trauma, misshapen noses can cause other significant health issues, such as interrupted sleep patterns. Poor sleep has a negative impact on all aspects of a teen’s life. With rhinoplasty, a teenager can alleviate any structural abnormalities and enjoy a return to a healthy, normal breathing state. Often times, through accident or traumatic injury, a teen’s nose can be damaged, resulting in obstructed nasal passages that impede his or her ability to easily breathe. A nose job, often combined with other procedures like septoplasty, can correct these structural issues and allow the teen to return to normal, natural appearance and functionality. Am I A Good Candidate For Teen Nose Job? 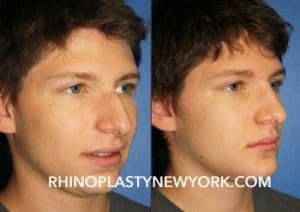 First and foremost, if you are a teen in New York City and considering rhinoplasty, your nose must have reached full development. This typically happens between the ages of 14 and 15 for girls and 16 or 18 for boys. The average age of Dr. Miller’s teen rhinoplasty patients is 15 to 19. During the consultation, Dr. Miller will assess your nasal bones, cartilage, and septum to determine if your nose has reached this stage. The other major consideration is whether you, as a teenager, are psychologically ready for the procedure. Teen patients that can clearly identify their rationale for the procedure and enunciate an understanding of all benefits and risks, make the best candidates. Whether it is to correct appearance or breathing abnormalities, with proper assessment and support, teens can be excellent rhinoplasty patients. 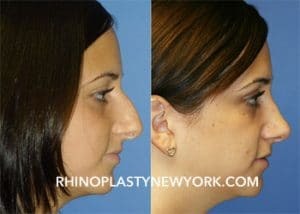 How Can I Learn More About Teen Rhinoplasty in NYC? 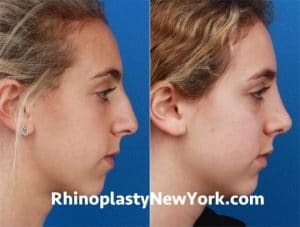 To learn more about teen rhinoplasty in New York City, visit medlineplus.gov or please contact our office to set up a consultation with Dr. Miller. You can fill out our convenient contact form or call us. One of our Patient Advisers will help you get started. Visit Our GalleryNext, learn about virtual rhinoplasty.